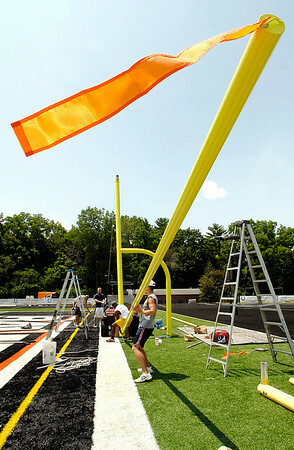 Crews were busy installing new goalposts at Macholtz Stadium on the Anderson University campus Thursday in preparation for the start of Colts Camp next week. The NFL changed the rules and increased the height of the goalposts by five feet requiring all new posts for the training camp. After camp is over the goals in the stadium will be changed back to the old ones to match collegiate standards.